Writing for the Ear – with Humor: Where's the TARP when you need it? Where's the TARP when you need it? 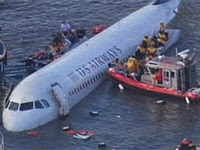 No sooner had the US Airways plane ditched in the Hudson River, it was surrounded by boats, rescue teams – and people in expensive suits. Not surprising. Nowadays wherever anyone is getting bailed out you're sure to find bank executives.